This post was featured in the October 1, 2009 installment of I and the Bird. If you like this post please become a follower or consider sharing it with the "share" button up above. These are my Top 10 Tips for new birders or those getting into bird watching. Add yours to the comments if you think I missed something! There are two parts to this. First off, take in the gestalt of the bird. Is it finch-like? Does it strike you as a type of falcon? How is it perching? Is it on the side of the tree or on a branch? Does it hold its tail up in the air as it feeds? Taking in the whole picture can help you with your identification when you are unsure. The other meaning of take in the whole bird is to look at ALL of the parts. Often when people begin birding they only look at a few key aspects of the bird. Beginners may note that it was a red bird with black on it. Depending on where it black is located though is the difference between a Northern Cardinal and a Scarlet Tanager. When trying to identify a bird you need to look at everything from the color and shape of the crown to the color of the feet. This plays nicely into the above tip to look at the whole bird. When I started out birding I would look at the bird and as soon as it flew off I would open up my field guide and start paging though it. Within a few minutes of staring at all the drawings though I found my memory became contaminated with what I was seeing in the photos. Was the breast yellow or was it the back that was yellow? Was that white stripe on the head above the eye or below the eye? It helps to stop and write down everything you remember before you ever open a field guide. Good notes are a must. 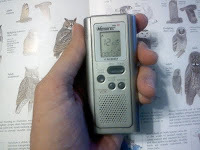 One of my favorite tools is a little digital pocket recorder. I have this one . I can turn it on and dictate into it while I am looking a a bird, I can record a little running commentary of what I see. i.e. "Small bird. Uniform gray crown with no streaking. White line above the eye, yellow throat but not bright yellow. No streaks or bars on breast. Yellow extends up to base of bill. No wing bars. Short bill. Pale back, maybe slightly olive, no distinguishing marks on back." Anyone care to guess in the comments what bird that is? With notes like these a birder can make a more certain call on ID later without confusing the details and relying on memory alone. You need to actually see the bird to make an ID. This may seem like an obvious statement but believe me that not all binoculars are created equal. Some are simply horrible and you can see more detail with your naked eyes. There are lots of just so-so binoculars out there though. These are ones you can pick up for somewhere between $20 and maybe as much as $100 depending on where you shop. They are decent and will show you a closer view a birds. The thing is though, that once you move beyond telling an American Robin from a Northern Cardinal, you may find that a slightly higher priced binocular is worth the investment. Whereas a cheap pair of binoculars will let you see the color of the bird, a really good pair of binoculars lets you see the detail of individual feathers. Sometimes that is the difference between making an ID of a bird and not making an ID. I'm not saying people need to run out and buy $3,000 binoculars. If you have the means, congratulations. There are some great binoculars between $180 and $250 that will serve most birders well for decades. Do your research. There are gems and dogs at all price points. You do generally get what you pay for though. I know birders who have had the same binoculars for 40 years. Ask yourself if you would willing to pay $20 a year for a pair of excellent binoculars you love. $20 per year over 40 years is $800. You can get one hell of a pair of binoculars for far less than $800. Binoculars are an investment in your future happiness. Probably one of the best deals out there are the 8x42 Nikon Monarchs . They are simply outstanding and the best binoculars you can buy in the $250 range. They are even better than some that cost more. Many people seem to think that using binoculars is as simple as putting them up to your eyes and looking. The truth is not so simple. Learn how to set the diopter on the binoculars and you'll see an incredible amount of detail you'd miss otherwise. Once you have the binoculars set to work for you, practice using them. What I really mean by this is practice finding birds in them. It is one thing to spot a bird in a tree with your eyes, it is another thing to then raise up your binoculars and hit that exact spot. You need to take in the location of the bird in your mind and notice features that will guide you to it once the binoculars are up to your eyes. Chickadees are excellent practice targets as they constantly move and make you learn how to follow birds, refocus and catch them. The more you practice the more you will be able to bring up your binoculars and find that that lifer bird is right dead center in your field of view. Speaking of chickadees, pay attention to habitat when you bird. Here's a cautionary tail. While doing some casual birding on Mt. Rainier years ago I saw a flash of movement in a tree. I searched around for a few minutes trying to get a view of the secretive bird though my binoculars. Finally the bird popped into view and I thought to myself, "Oh, just a chickadee." I immediately stopped looking at this common bird and went on my way. It was months later that it dawned on me that it may have been a Mountain Chickadee and not one of the thousands of Black-capped Chickadees I see at home every year. If I had been paying better attention to the habitat I was birding in I would have been able to make the correct ID and I'd have a Mountain Chickadee on my life list. In a more general sense, knowing what birds to expect in given habitats can help you find birds and make the ID. If you are birding in a sedge marsh there's a good chance that wren looking bird you just spotted was a sedge wren and not a house wren. Sometimes even with the best observations, seeing the bird is not enough. Take Willow and Alder flycatchers for example. Even when holding one in your hand they are virtually indistinguishable. Their calls are different though. If you have your ID narrowed down to one of the two and the bird suddenly gives a clear call the ID becomes obvious...but only if you know the difference in the calls. Knowing calls is especially important when you can only see part of a bird. The bird will not always present itself in perfect conditions to make an ID by sight alone. Another advantage of knowing calls is that it can alert you to the presence of things you want to see. I saw my first Blackburnian Warbler because I had my ears open in the woods and suddenly heard a call that stood out in my head as different. I searched out the source of the call and discovered the bird. Birding is different every month of the year. Do some reading, talk to other birders and learn what each month and season brings in your area. Different birding areas are best at different times of the year. Knowing where to go is part of the challenge to finding birds. Knowing when to go to each spot is just as important. Knowing what birds are in your area at any given time can help with ID as well. Different people learn though different methods. Some people learn best by reading field guides. Some people learn well though videos or audio recordings. Many people learn best by going out in the field and trying things for themselves. Personally I find birding by ear type CDs and tapes are really hard to learn from. After a while all the bird songs run together in my mind. However, learning bird songs in the field burns them into my brain. Find out what works best for you and then do it. Try flash cards, web sites, drawing birds, in short, any method that works. This is a huge hidden weakness for many people. We grow tired and accustomed to the birds we see every day but the truth is we never actually take any time to study them precisely because we think we know them so well. Here's some sample quiz questions about common birds. Is the American Robin's eye ring complete or broken? What color are the edges of the secondaries on a black-capped chickadee? Does a female purple finch have an eye ring? These seem like pointless questions until we find ourselves away from home. Wait, is that a female Purple Finch or a female Cassin's Finch? If you know that the female Cassin's has an eye ring but the purple finch does not then you can tell them apart and you know when something looks different. Same goes for the Chickadee. If you're from up north and you know that Black-capped Chickadees at home have white edged secondaries you might notice that when you're down south the chickadees have grey edges to their secondaries and are actually Carolina Chickadees. This is also useful when you run into rarities. If you know that immature American Robins have a gray tail then you wouldn't mistake a rare Fieldfair with a black tail in a flock of robins as just another juvenile American Robin. Everyone has a favorite field guide. I favor Sibley in most situations but I have more than a handful of other guides. The Sibley Guide to Birds is nice because it shows both flight and perching poses for most birds and the pages are laid out to quickly compare similar species. The full guide is a massive tome but the Eastern Guide and the Western Guide are more pocket sized and will become your best friend. One thing to avoid as a beginner is field guides organized by color. I know they are extremely tempting. They can be handy for beginners but these guides often don't put males and females of the same species together (which can be handy as males and females hang out together in the wild) and they usually only show the most common birds. Once you can name all the really common yard birds this type of guide will actually slow you down as it will not contain all the birds you want to see and you won't learn how to identify types of birds as quickly. Being able to look at a bird and know that it is a vireo or a thrush or a sparrow, etc. is an important first step in identifying a bird and having a guide laid out by family groups will speed your learning of these groupings. Once you have a favorite guide, always take it with you. Birds you can't identify sneak up on you when you least expect it. Get out there and bird! The only things I might add is in #1...Watch for a tail wag and in #10..don't get stuck in just one Field Guide. While I use Sibley's a lot, I find that Peterson's and Kaufman's sometimes are better. Thee are a lot of great books out there. Sure enough. I mentioned Sibley as my favorite but I use a bunch of them. I thing National Geographic might be my second favorite if only because it covers the whole country in one compact book. I'm intrigued by the Kaufman guide but haven't really used it enough to get a feel for it in the field. Excellent post Kirk. I find that "looking at the whole bird" is indeed critical. What shape and color is it's bill? Is it a seed eater or an insectivore? I think noticing the birds behavior is a huge part of this tip. Is the bird foraging on the ground or is it gleaning insects form the bark of a tree. I like your second tip and think I should do some recording myself, although being a photographer, I try to get a photo of the bird so I can take another look later (which is many times not possible). I usually write down a description since I always have a notepad with me. And I totally agree with you that once you start looking at birds in the field guide, without writing anything down or having the bird in front of you, you are doomed until you have some experience. Having a good pair of binoculars and knowing how to use them is a must. The only thing I would add to this is to physically try out some binoculars in a store before you buy. Do your research on price and quality, then go find those bins and try them out. You may find that a great pair of bins don't fit your grip or your eyes. For instance, my eyes are very close together and I need bins that can close to an interocular distance of about 2 1/2". Learning the behavior of the birds and in what habitat they may be found will help immensely. Your tale of the Chickadee is very important. Never assume the bird you saw was the usual fare. It may be an Ivory-billed Woodpecker rather than just a common Pileated. And birding by ear has got to be one of the most important tips here Kirk. Learning bird calls will help you find more birds when in the field as well as help with ID. There are so many excellent field guides out there it is hard to pick one. I do like Sibley's for use in the filed but I also like Peterson's as a reference since it covers all of North America, even though it is too large for a field guide. My guess on your mystery bird is Philadelphia Vireo or Tennessee Warbler. Again,thanks for the great post Kirk. This is excellent advise for new and old birders alike. Thanks for the comments Larry. I take photos in the field too and it helps a lot. Even a bad photo is often enough to make an ID and then once I know what I am looking for I have a better chance of finding it again later. Good advice too about actually trying binoculars. This is especially true if you wear glasses. You got the mystery bird right too. I was describing a Philadelphia vireo. Great post, Kirk. This has lots of great advice for a novice such as myself.